to master and edit your recordings. The Q2HD's switchable low-cut filter reduces unwanted background noise by cutting the low-frequency range. Compatible with SD/SDHC/SDXC cards up to 128Gb. The Q2HD uses just 2 x AA batteries. IF YOU ALREADY OWN A ZOOM Q2 YOU MAY STILL PURCHASE SOME OF ITS ACCESSORIES FROM OUR Q2 WEBSHOP BELOW. And do it all in high def. Full HD video recording + uncompressed audio recording + live streaming. 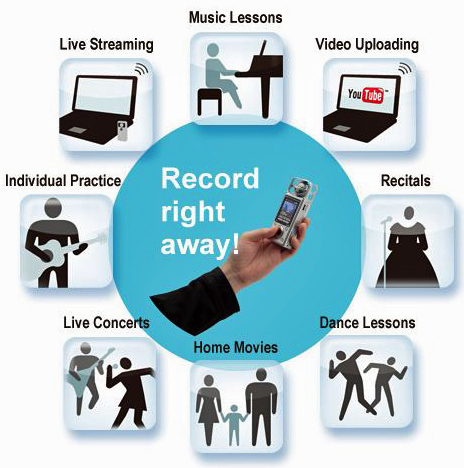 The Q2HD Handy Recorder increases your enjoyment of music - or any sound source - along with video and the internet. It allows you to capture every moment in sound and picture with stunning clarity and resolution, and then upload or stream it live quickly and easily. The Q2HD is very much an audio-driven unit. Its video function is an adjunct to its audio capabilities rather than the other way round. 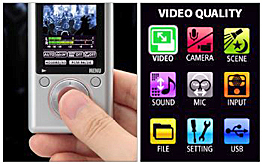 Indeed, you can even turn the video function off and just use it as a serious professional stereo audio recorder. Optimal audio and/or video recording is possible in any location - whether it be a large hall or small club. And during music lessons you can stay focused on practicing and reviewing performances by students and teachers alike. Simply put, the Q2HD will just make your life more creative. Using the analogue-type MIC GAIN wheel allows you to dial-in the perfect amount of gain for any recording application. Or choose one of three presets (Concert / Solo / Meeting) of the Auto Gain function to automatically set the recording level for any given situation. It’s really easy to get great sound no matter what you're shooting. 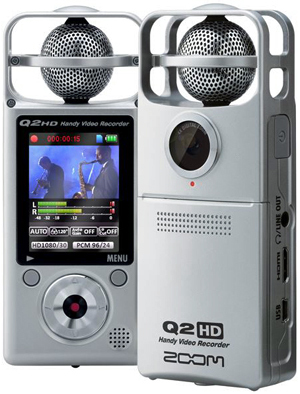 The Q2HD can be used as an audio recorder to record just sound (without video). 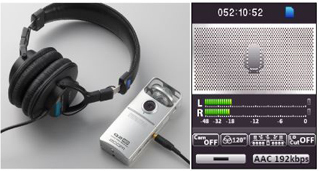 In addition to being able to record 24-bit/96 kHz PCM files that far exceed CD-quality, the unit can also record AAC (m4a format) files that have smaller sizes. The Q2HD also features an internal reference speaker so you can check recordings without earphones. 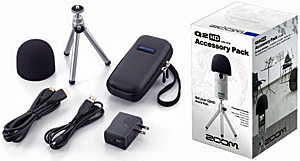 Expanding its versatility, the Q2HD also functions as a USB microphone with Mid-Side microphone capabilities. Simply choose USB Mic in the units MENU and connect your Q2HD to a computer or iPad (using Apple’s USB camera connector) to begin recording. 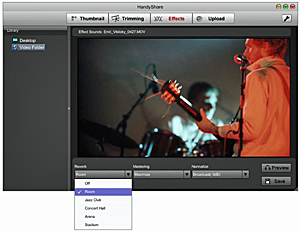 The Q2HD’s bundled HandyShare editing and uploading software (see left panel) lets you to manage and edit your videos easily, as well as upload them to social networking sites. From live musical performances, rehearsals and recitals to journalism, education and sports, you can easily share your movies with everyone on your favorite websites like YouTube or Vimeo. Moreover, effect functions in the software allow you to bring the sound of video recordings up to the level of a finished product. Normalize a recording for a consistent volume level, add reverb to give rich reflections to the sounds of instruments and voices and use a mastering effect to enhance the impact of a performance with compression. Just select a preset. It’s easy enough for anyone to use.